What is it to live without a child, to bury a child& to no longer see your child. It’s a feeling you wish to never feel, it’s a nightmare that no one thinks could be real. But this is our reality, this is our life. Here is a glimpse of how our days look. In the mornings we wake up, pass Mason’s empty room, open his curtains and say good morning as if he is still in bed just waking up. At the same time we have Miller in our arms and make sure to say ” Good morning big brother Mason.” It’s part of our morning routine and will always be. Our days go on like any other day, except we imagine what Mason would say,do and ask for that day. We often find ourselves saying little things he would say or hear his little laugh as we do something that he would have loved. We listen to his favourite songs and Miller always falls asleep to them. Most mornings are now filled with cuddles from Miller as we tell him stories of his big brother. Our house is filled with everything Mason, pictures that hang on the wall, custom artwork that others made, sculptures of our hands together and of course tons of his toys. As I hold Miller and walk around the house looking at all the beautiful artwork, he always holds my necklace which is a heart pendant with Mason’s thumb print, as if they are holding hands. Our day goes on, but not without moments of heartbreak and sadness, when we feel this we know we need to pack up the blankets and go sit with him at his grave site. There we find comfort in being together, it’s hard to explain, but it helps calm us on hard days. Most times you will find us sitting there talking about our day and remembering the little funny moments we shared. 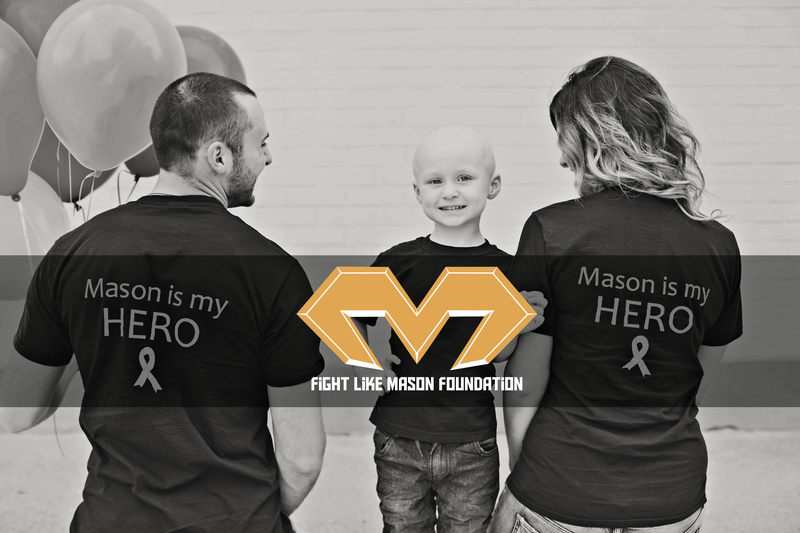 Everyday the Fight Like Mason Foundation is worked on by us. Whether it’s folding and bagging every shirt, filling orders, finding new and better ways we can make a difference and what we can do better for these kids facing these battles. It’s a major part of everyday and our hearts are fully into every detail of it. It is the promise we made to Mason and its one we will always keep. We also find the time to release our anxiety and everything else that comes with the nightmare of losing a child. How we relieved these feelings is by working out, helping your mind just focus on strength and allowing it stop concentrating on the flashbacks of “what more could we have done to save him”. No the feelings don’t completely vanish but it does allow us to have an hour to just stop thinking of all the what ifs. Our outlook on life has changed drastically. Everyday is special, we can no longer dwell on the negativity that surrounds us. We now fill our lives with the people that want to be in it, that want a relationship with us, the ones who aren’t afraid to talk about Mason & the ones who aren’t afraid to be around us. The ones that don’t make us feel guilty about speaking of our boy and the ones who show us unconditional love and support. The ones who stuck by our sides in the hardest times and continue to stick by our sides now. Through this nightmare of a journey we have met the most amazing friends and most of which we can’t imagine our lives without. We would not have made it through these tough days without our family&friends. The one thing that will never change throughout this journey is the love that we have in our home, it will never disappear. This home is full of love even on the saddest days & it only continues to grow with everyday that passes. Don’t try to put yourself in our shoes, because i would never wish this kind of pain on anyone. Everyday we wake up and continue life how Mason would live it. Its the most challenging journey to figure out, and it will never be answered. All that we can do is bring Mason through this life in our hearts, never ever letting him to be forgotten. Mason will never be forgotten in our house! We promise! Your routine works for you! Everyone is different., Continue what works for you and your family. Mason will never be forgotten. God bless you and your family.